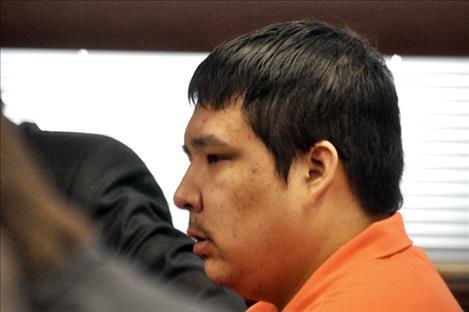 RONAN — A Ronan man was sentenced to 10 years in the Montana State Prison on July 29 for killing a toddler last year. Galen Hawk, 26, was also ordered to serve 13 months in the Montana Department of Corrections after the first punishment was complete, with an additional three-year suspended sentence to follow for felony driving under the influence of alcohol. Hawk admitted to investigating authorities that he shot and killed his nephew, 3-year-old Lonato Moran-Allen, in a game of “gun tag” after a night of drinking on Oct. 22, 2014. He said nothing before sentencing, and remained silent with his eyes downcast as the punishment was announced. Hawk agreed to plead guilty to negligent homicide charges in exchange for prosecuting attorneys not seeking a sentence enhancement on the charges. The prosecution and defense could not agree to a punishment in the case. Lake County Chief Deputy Attorney James Lapotka asked for a 20-year sentence to Montana State Prison for the homicide case, with 10 years suspended. He additionally requested a 13-month commitment to the WATCH alcohol treatment program, followed by a five-year suspended sentence to the Montana Department of Corrections. 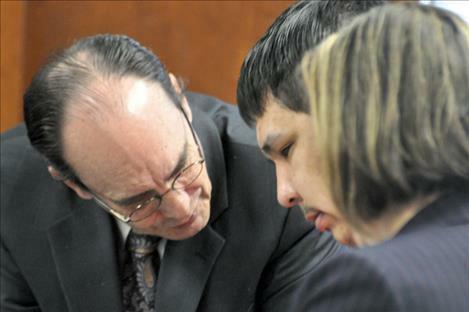 Lapotka said he wanted to punish Hawk for pointing and firing a gun at a toddler while drunk. Former Public Defender Matt Pavelich told Lake County District Court Judge James Manley that he would prefer to see a 20-year commitment to the Montana Department of Corrections. “I don’t think the court can sentence Galen Hawk to a worse sentence than he faces everyday,” Pavelich said, referencing the guilt he believes Hawk feels for killing his nephew. Hawk’s brother, James Allen, father of the child, also testified in favor of leniency. Allen was brought from Lake County Jail where he is facing felony charges for evading law enforcement and shooting at a police officer just weeks after his son’s death. “I wish you would be easy on my brother,” Allen told Manley. Allen said that Hawk was his “partner” and “sidekick” who helped care for the child since the day he was brought home from the hospital. Allen said when the baby was five days old, he left the infant with Hawk while he went to Walmart. Allen said he has been very angry at his brother, but that he has to learn to let the anger go or it will eat at him. Manley took into consideration the testimony and findings presented in a pre-sentence investigation before he sentenced Hawk. Manley said he didn’t doubt there was some goodness in Hawk, as Allen testified, but that his abuse of alcohol was concerning. “You are a serious danger to the community,” Manley said. In addition to the prison sentence, once released, Hawk will have to pay the child’s mother more than $20,000 in restitution.